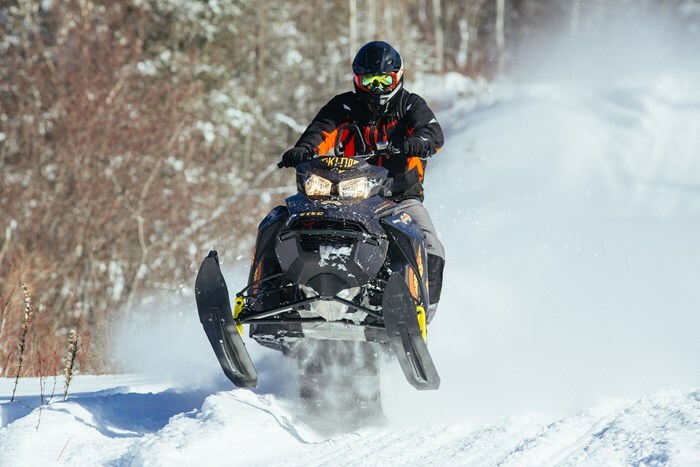 Thanks to the amazing What A Ride Team and Mike Brazeau at Horwood Lake Lodge, I was given the pleasure of riding the 2017 Ski-Doo Summit X 850. Not only that, it had a sweet wrap thanks to Mikey’s Team and that exhaust can make anyone feel like a pro. Wow! After riding this 850, my ’12 XRS 800 seems a bit tame. I have seemingly “new” muscles that are sore thanks to the constant torque. Even at 96% break-in mode, this motor was very powerful, exceptionally smooth and had very linear and even power at any speed. Like many newer E-TEC’s, when going under 20km/hr, poking around slowly bush bashing, the fuel injection/ignition/clutching combo is dead on. The pDrive primary clutch is the best version yet, and my buddy Mike Schmidt of London Recreation Racing agrees—he loves the ease of tuning and cleaning. 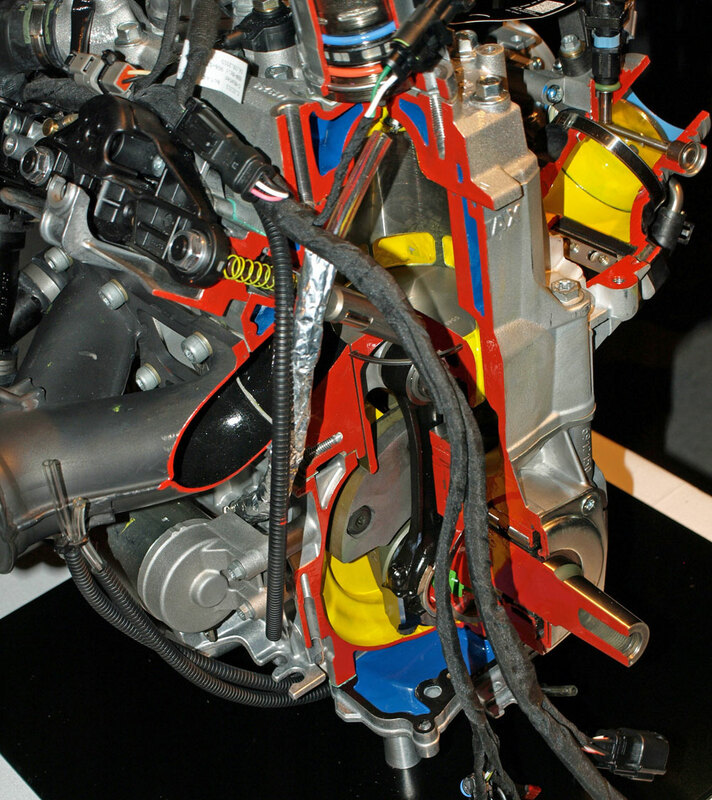 These motors have been built like mini single cylinder diesels, then mated together to make a twin. Take 5 minutes for specific tech details thanks to Dave Norona. Who’s going to be the first to turn this into a triple/quad/5-cylinder?? 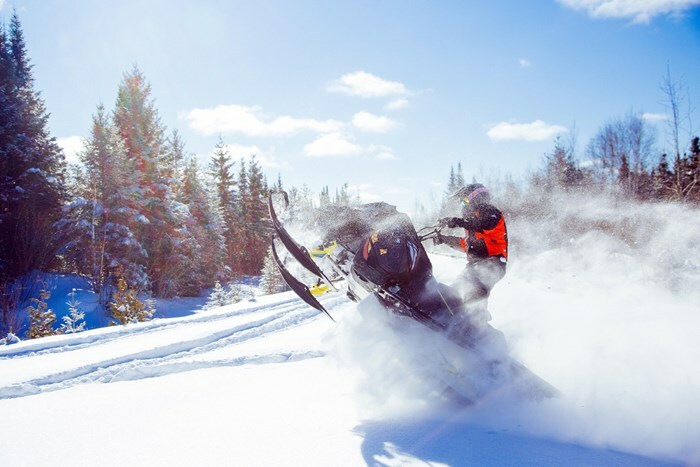 Since we were on Horwood’s 180km+ of groomed, private trails and many off trail spots, the can sounded amazing! Yes, I’m an MBRP guy, but I have used a steel race can that Graham built and loved it. Each manufacturer offers their own sound, so pick yours! Marine guys, check out these muffled stainless exhaust tips, they’re second to none! Thanks again for that touch Mikey’s! Racing Snocross, I was amazed at Searchmont in November of 2001 when Blair Morgan showed up to campaign the first ever REV chassis. That was such a game changer! Yes, the XP/XS/XM were a decided upgrade as well. 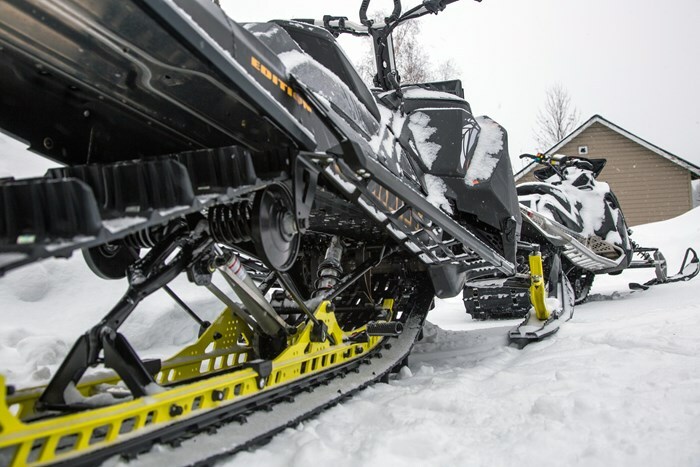 We should all give thanks to Ski-Doo and Blair because without them this Gen 4 would have evolved into the comfortable and exceptionally manoeuvrable sled that it is. Even comfy with one knee on the seat for some of the 6-mile bush bash trail we ran. The angled tunnel top and the integrated heat exchanger have added strength and rigidity, and for a “little” 5’8” guy like me, I finally have my boot soles completely on the inside of the running board edges. The 3 stage panels work well, but it will take some more getting used to for me. 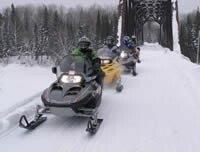 Wearing my Klim Keweenaw and Storm bibs (snow pants) with integrated knee padding avoided any bruises from the angled bumps in the panels. Does it handle? When a Summit can stay flat and corner on flat trail, you know the future is here. I wouldn’t say that about the XM chassis. 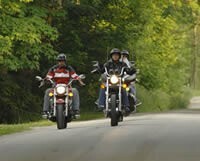 Go ride a Gen4. Summit 154” In Northern Ontario? Yeah yeah, westerners, call us “flat landers” all you want. I dare you to come play boys & girls! We bush bash in dense bush, climb the dangerous Canadian Shield, jump natural rhythms, and cross water like it’s Summer not -32°C. 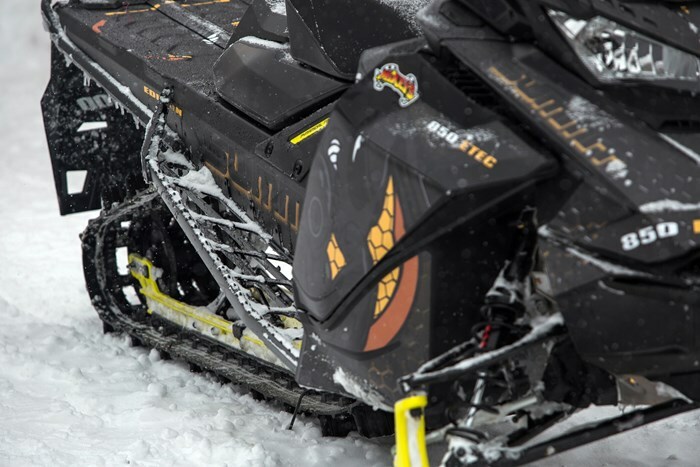 Northern Ontario riders, this sled works! We had mid-cold temps with freshly groomed hard-pack topped by 15 centimetres of fresh. Sure it was a bit sensitive to body English and was sensitively roly-poly when riding aggressively with the skis up, but to my surprise it handled and cornered very well when riding normally. I can only imagine what the 129/137” feels like! No, I couldn’t get it stuck in February Timmins ’17 snow. Yes it side-hilled, carved, and lifted skis with ease. No, it didn’t get hot even once in 15 centimetres of fresh and no I didn’t need the scratchers, even with the 3” track. Impressed, but that’s not a whole winter riding all types of conditions, so it remains to be seen. 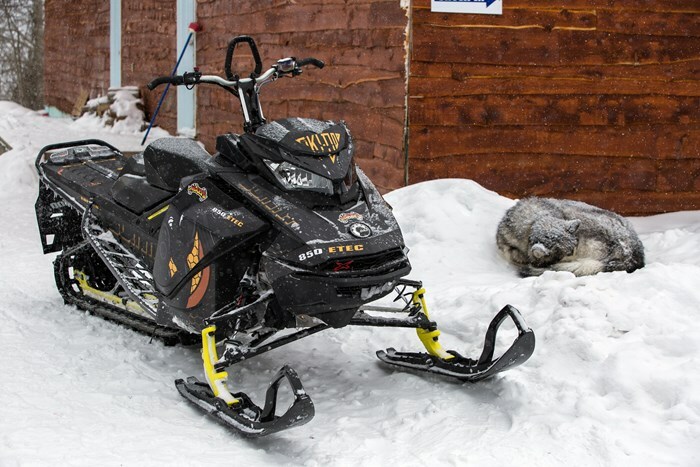 Ski-Doo keeps evolving. Their quality of buttons and switches are excellent and well-placed. The upgraded DESS is a sigh of relief. 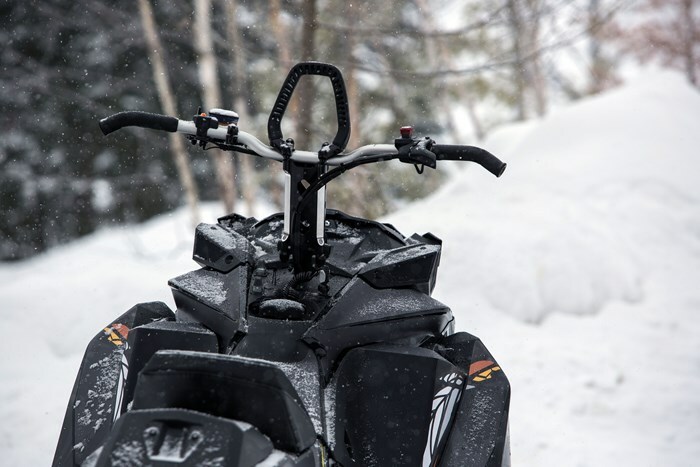 The bars & riser combo is second to none in my opinion, for all models I’ve ridden for years. That could be influenced by the fact that they also vibrate the least. I’m very thankful for their dedication to improvement and innovation. Yes, the gauge on the Summit is too small for my liking, but there’s a Mountain riding/rolling reason for that, and who needs it anyway. This is “Random” Ryan Tarrant saying thanks for reading! Check out and like my Facebook Page if you’re interested in more upcoming content, please & thank you.